PNNL researcher Chongmin Wang and colleagues have developed the first step-by-step explanation of how a lithium-air battery forms bubbles, which expand the battery and create wear and tear that can cause it to fail. The research was aided by an environmental transmission electron microscope (shown here), which enabled the creation of a first-of-a-kind video that shows bubbles inflating and later deflating inside a nanobattery. RICHLAND, Wash. — With about three times the energy capacity by weight of today's lithium-ion batteries, lithium-air batteries could one day enable electric cars to drive farther on a single charge. But the technology has several holdups, including losing energy as it stores and releases its charge. If researchers could better understand the basic reactions that occur as the battery charges and discharges electricity, the battery's performance could be improved. One reaction that hasn't been fully explained is how oxygen blows bubbles inside a lithium-air battery when it discharges. The bubbles expand the battery and create wear and tear that can cause it to fail. A paper in Nature Nanotechnology provides the first step-by-step explanation of how lithium-air batteries form bubbles. The research was aided by a first-of-a-kind video that shows bubbles inflating and later deflating inside a nanobattery. Researchers had previously only seen the bubbles, but not how they were created. "If we fully understand the bubble formation process, we could build better lithium-air batteries that create fewer bubbles," noted the paper's corresponding author, Chongmin Wang, of the Department of Energy's Pacific Northwest National Laboratory. "The result could be more compact and stable batteries that hold onto their charge longer." PNNL researchers used an environmental transmission electron microscope to record a first-of-a-kind video that shows bubbles inflating and later deflating inside a tiny lithium-air battery. The video helped researchers develop the first step-by-step explanation of how lithium-air batteries form bubbles. The knowledge could help make lithium-air batteries that are more compact, stable and can hold onto a charge longer. 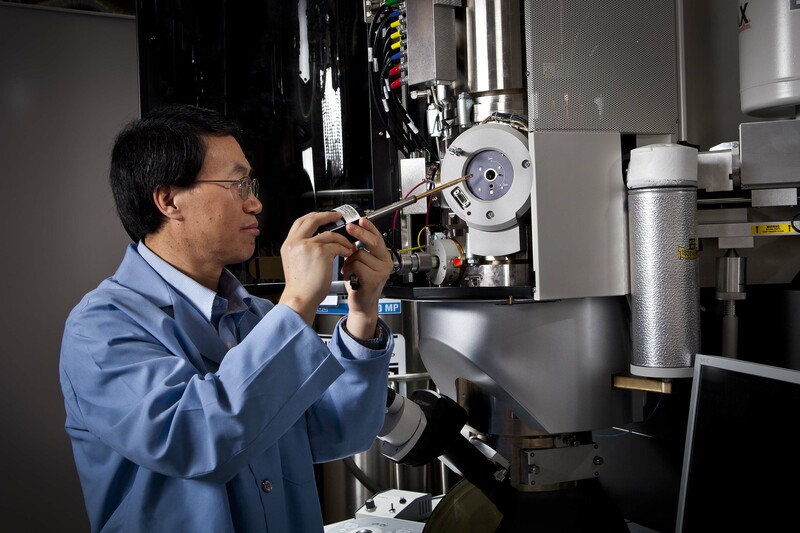 Wang works out of EMSL, the Environmental Molecular Sciences Laboratory, a DOE Office of Science user facility located at PNNL. His co-authors include other PNNL staff and a researcher from Tianjin Polytechnic University in China. The team's unique video may be a silent black-and-white film, but it provides plenty of action. Popping out from the battery's flat surface is a grey bubble that grows bigger and bigger. Later, the bubble deflates, the top turning inside of itself until only a scrunched-up shell is left behind. The popcorn-worthy flick was captured with an in-situ environmental transmission electron microscope at EMSL. Wang and his colleagues built their tiny battery inside the microscope's column. This enabled them to watch as the battery charged and discharged inside. Video evidence led the team to propose that as the battery discharges, a sphere of lithium superoxide jets out from the battery's positive electrode and becomes coated with lithium oxide. The sphere's superoxide interior then goes through a chemical reaction that forms lithium peroxide and oxygen. Oxygen gas is released and inflates the bubble. When the battery charges, lithium peroxide decomposes, and leaves the former bubble to look like a deflated balloon. This finding was the focus of a Nature News & Views column written by researchers at Korea's Hanyang University, who describe the research as "a solid foundation for future Li-O2 battery designs and optimization." This research was supported by DOE's Office of Energy Efficiency and Renewable Energy. Reference: Langli Luo, Bin Liu, Shidong Song, Wu Xu, Ji-Guang Zhang, Chongmin Wang, Revealing the reaction mechanisms of Li-O2 batteries using environmental transmission electron microscopy, Nature Nanotechnology, March 27, 2017, DOI: 10.1038/nnano.2017.27. Read more in this News & Views article: Yang-Kook Sun and Chong S. Yoon, Lithium-oxygen batteries: The reaction mechanism revealed, Nature Nanotechnology, March 27, 2017, DOI: 10.1038/nnano.2017.40.